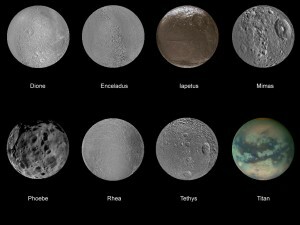 When you think of moons, you probably think of our own bright moon, but there are many other moons in our solar system. Moons orbit planets and are made of ice or rock. Most moons have no atmosphere. They are very hot or very cold. Some are dark. Some are even lumpy. Moons were created 4.5 billion years ago when the rest of the solar system was made. Not all planets have moons. Mercury and Venus have no moons. Earth has only one. Mars has two. The large gas planets have more moons. Because these planets are so large, they have a huge magnetic field that can pull in moons. Jupiter has 50 known moons, plus 16 more that haven’t been confirmed yet. Keep reading to know more all about moons of other planets. Jupiter has 50 known moons, plus 16 more that haven’t been confirmed yet. Saturn has 53 moons, plus 9 more possible moons. In 1610, Galileo discovered four moons of Jupiter. One of the moons circling Mars is slowly getting closer to the planet. It might even collide with the planet in another 50 million years. No need to worry now! A video presentation about the 2 moons of Mars. Question: Where do the moons get their names? 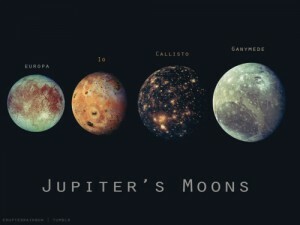 Answer: Most of the moons have interesting names like Io or Callisto. Most of these names come from characters in ancient Greek or Roman mythology. Enjoyed the Easy Science for Kids Website all about Moons info? Take the FREE & fun all about Moons quiz and download FREE Moons worksheet for kids. For lengthy info click here. Declan, Tobin. " Other Planet Moon Facts for Kids ." Easy Science for Kids, Apr 2019. Web. 21 Apr 2019. < https://easyscienceforkids.com/all-about-moons/ >.